New Muni Debt Offerings Scheduled Week of August 27 2018 & Note of Condolence and Tribute to Senator John McCain, a true American Hero. 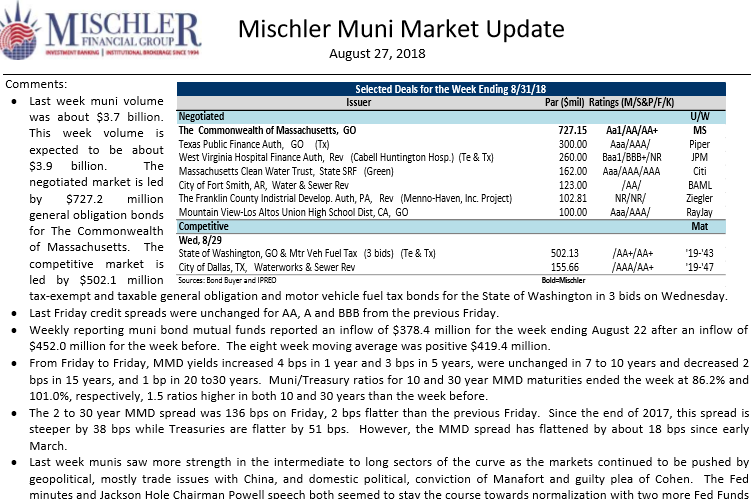 This week’s Mischler Muni Market Update is dedicated to and sadly prefaced by Mischler Financial Group note of condolence to the family of Senator John McCain and our tribute to a man who was not only a valiant military hero who made so many personal sacrifices throughout his military career and served with great honor, he dedicated his life to our country throughout a multi-decade leadership role within the halls of the US Senate. 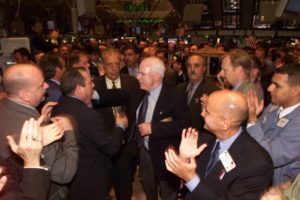 Senator McCain exemplified what is truly great about our country–his integrity, honesty, humility, pure sense of humanity and passionate dedication to advocating on behalf of those who could not advocate on behalf of themselves made him a role model in every sense of the phrase. Those who dare to dispute whether those captured behind military lines and then tortured while being held in captivity as a POW ‘deserve’ to be referred to as a hero know not what an American Hero is and seemingly, know even less as to the many reasons why the United States of America is and has always remained the world’s icon of freedom and democracy since our founding fathers forged our Constitution and Bill of Rights. In an new era that has been distracted by political gamesmanship and what seems to be a frightening cultural shift that portends to threaten long embraced values, right-minded views and thoughtful approach to government leadership–and the very fabric of what we have always held dear, Senator McCain proved he really was a ‘maverick’; up until his last breathing moments he was determined to be a voice of reason and sensibility. Never one to take his oath of office for granted, McCain’s legacy for always reaching across the aisle to engage with and embrace those who may have disagreed with his views in order to forge legislation and policy for the betterment of all the people puts him on a pedestal that only a handful of American leaders throughout the country’s history can make claim to. Many of us at Mischler Financial have served in the US Military, several of us served during the Vietnam ‘conflict’ and more than several of us were injured in the line of duty. We have the scars to prove it, should we have to. Military veterans are by and large, a unique community of people. We’re trained to defend and honor the rights of all Americans and trained to fight with honor, even to the death, in order to protect our comrades in arms and all of our countrymen and countrywomen. For many of us, that training has led to battlefield engagements and injuries sustained that we prefer not to speak of. Instead, our personal missions and our mission as members of a highly-skilled team of professionals has remained true to the oath we each took when joining the US military–to uphold the Constitution and to defend the rights and liberties of all Americans–and to preserve and protect the values that has always made America great. 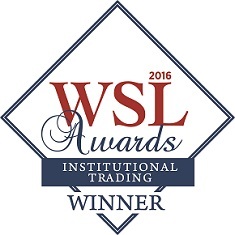 We’re proud to carry over those disciplines and sense of duty in the course of serving our financial and investment industry clients as well as their constituents and the communities we live in. Last week muni volume was about $3.7 billion. This week volume is expected to be about $3.9 billion. The negotiated market is led by $727.2 million general obligation bonds for The Commonwealth of Massachusetts. The competitive market is led by $502.1 million tax-exempt and taxable general obligation and motor vehicle fuel tax bonds for the State of Washington in 3 bids on Wednesday.